This page still very much incomplete but here are a few pictures of some old VTR's. Philips EL3400 1" Omega-Wrap VTR. Next is a Peto Scott E2770. As can be seen, it is very similar to the Philips machine above, however, it is not exactly the same. There are less A/V sockets on the back, and the Din socket on the front of the Philips has been replaced by a quarter-inch jack socket. The video head on this (and the Philips machines above and directly below) is extremely easy to change and was designed to be changed by the user. The white plastic head cover lifts off and the head is simply clicked into place. This next machine is the fully transistorised Philips LDL1200. 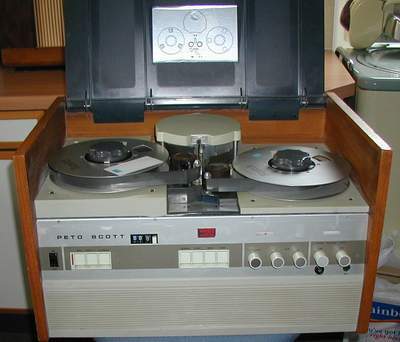 It uses a variation of the deck from the Philips and Peto Scott machines (Above.) However, the tape is much easier to thread because there are no posts on the outside of the head drum. Philips LDL1200 1" Omega-Wrap VTR. The next machine is the Philips EL3402. It is a much more modern looking machine than the LDL1200 and EL3400 (Above.) 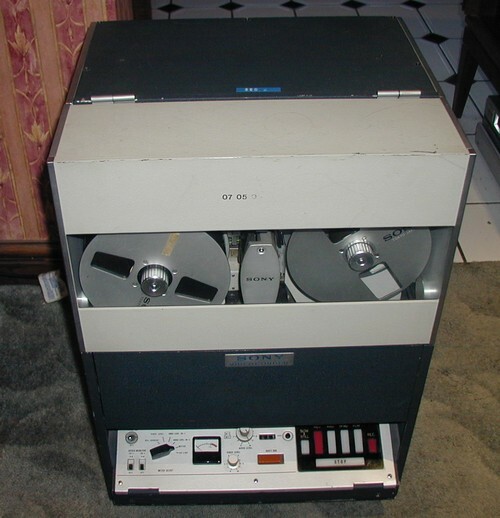 Interestingly, although the machine uses exactly the same 1" tapes as the the LDL1200 and EL3400, the tape is wound the other way round on the spool because the machine employs an Alpha-Wrap instead of an Omega-Wrap configuration. This type of wrap is much kinder to tapes than the Omega-Wrap because there are no sharp angles. A sure-fire way of telling what type of machine a given tape was recorded on is by looking to see which side of the tape is shiny and which is dull. Philips EL3402 1" Alpha-Wrap VTR. This machine is the Philips LDL1000. In many ways it was the pre-runner to the Philips N1500 VCR. 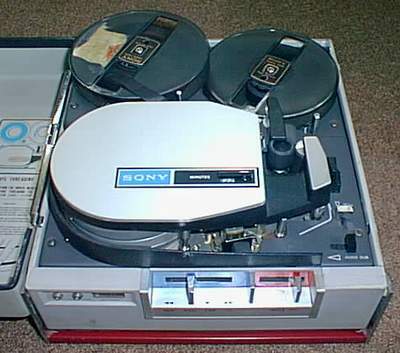 It was produced as a home TV recorder, although you needed to have your TV modified if you actually wanted to record or play anything back. The machine is black-and-white only and is relatively simple. Other than the head drum which is a bit of a giveaway, you would hardly know that it wasn't simply an audio tape recorder. Note the odd way that the tape is threaded onto the take-up spool. Philips LDL1000 1" Omega-Wrap VTR. 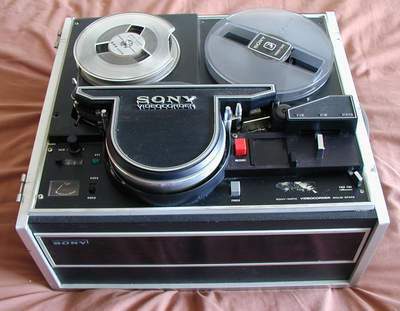 The next machine is a 1976 Sony CV3620. It was absolutely brand-new when I bought it in 1999. It was all boxed up with the protective material still intact and the unopened box of leads and attachments still with the machine. Since then it has had a few hours use only. The machine doesn't use the skip-field method of recording like the CV2100 above, but conforms to the EIAJ standard. 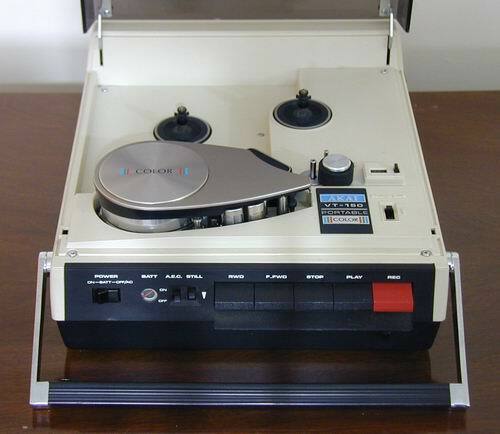 This is a 1975 Sony portable (Video Rover) model AV3420. Like the AV3620 above, it conforms to the EIAJ format of recording. These battery operated machines seem to turn up on a fairly regular basis and were quite popular for making home-videos with the complimentary Sony black and white video camera. Although a bit tatty, this particular machine works very well. 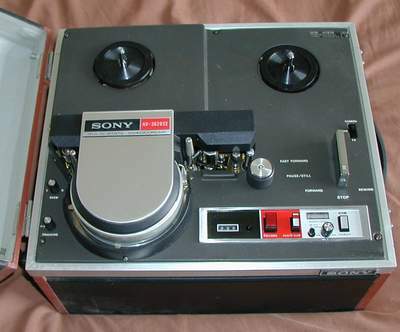 Here is a 1963 Sony PV120EU. 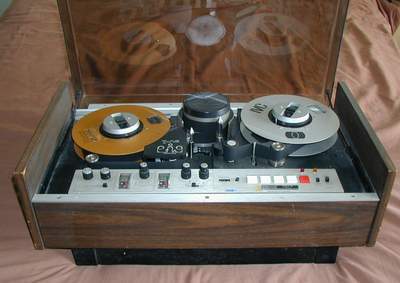 I'm not really too sure of the history of this model, but it is one of the very first industrial / academic / semi-professional reel-to-reel videos, long predating EIAJ, C-Format etc. 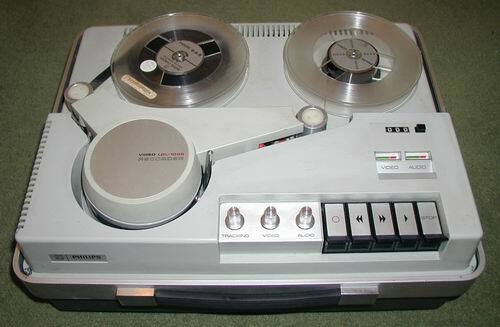 The machine is fully transistorised unlike the zero-transistor Philips EL3400 from 1964 and uses 2 inch tape. This machine is a single-video-head IVC model 761p and came from a school in Blandford Forum. It worked a treat until a little while ago when it stopped passing or recording any E-E signal. I could really do with a service manual for it. A friend of mine has an IVC 800 which looks very similar but has a metal case. This machine has a colour-under board in it, but even without it, it manages to record native (4.43MHz) colour (to a fashion) which is a pretty amazing feat really. 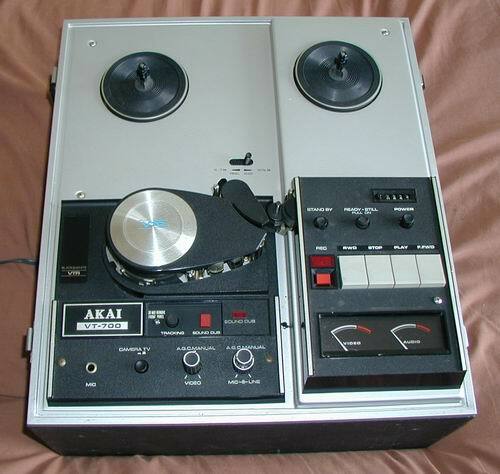 Next is an Akai VT150. This video is the smaller (portable) brother to the VT700 above, although this VTR is a later model and also has the benefit of colour. The power supply and RF modulator comes as separate units. This machine came from the National Vintage Communications Fair at the NEC in Solihull some years ago. How about this for a basic machine. 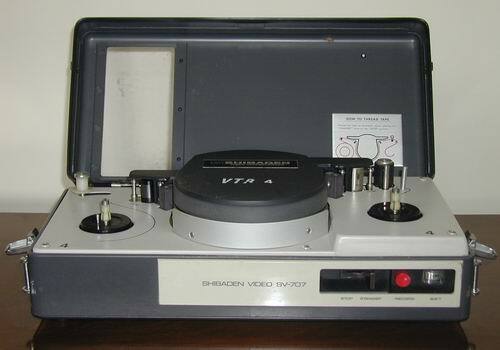 It's a Shibaden SV707 and it records video. And that's it. It has no Play, Rewind, Fast Forward or any other facilities. It just records. Once you've finished with the tape, you take it off and rewind and play it somewhere else. The unit has a compartment in the bottom for a battery and a leather case with handles for wearing the unit on your back.